Skytopia : Greatest Nintendo SNES music! If you've heard little or no SNES (Super Famicom) games music, then you are missing out on some of the greatest music ever composed! Despite the 'chippy' nature of the sound sometimes, the SNES has been host to some real masterpieces. Never heard the delights of Secret of Mana, Pop 'n' Twinbee, Kirby, or Axelay? Well now's your chance. I have in fact rated a whole collection of SNES music (taking into account factors of rhythm, melody, intricacy and general orchestration. ), so if you want to listen to the cream of SNES music - and would like to take a trip into nostalgia land, then you have come to the right place. Finally, two excellent resources to download SNES game music can be found at: Zophar's main SPC library and SNESmusic.org (or its mirror). Both of these sources will have the tunes listed - with Zophar having more games (and the convenient RAR format), but SNESmusic.org having more complete info (composer names, time/file info). Both are very good, so it's up to you. Special thanks of course go to the composers for creating such brilliant music in the first place, and cheers also to the people who have taken the time to preserve and organise the music for future generations to hear. Without the help of these people, this page would not have been possible! 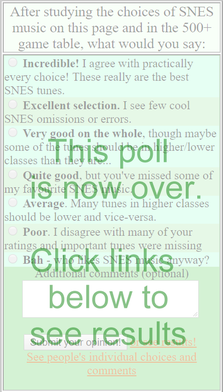 Is your favorite SNES music not reviewed on the other page? If not, then you'll most probably find it in the gigantic table I have compiled - Possibly the most comprehensive breakdown of Super Nintendo (Famicom) music yet! You'll find over 1000 game tunes (including snes music from: Bahamut Lagoon, Cardmaster, Chrono Trigger, Donkey Kong country 1/2, Dragon Quest 3, Final Fantasy 2/4, Final Fantasy 3/6, Final Fantasy 5, Kikikaikai (Pocky and Rocky 3), Hiouden: Maou Tachi Tono Chikai, Jim Power, Kirby, Legend of the Mystical Ninja (Ganbare Goemon), Lennus 2, Parodius, Phalanx, Pilotwings, Sim City, Twinbee - Rainbow Bell Adventures, Sparkster, Super Bomberman 2, Super CastleVania 4, Super Mario World, Super Robot Taisen Gaiden, Super Turrican 2/1, Actraiser, Super Bonk, Super Earth Defense Force, Gradius 3, Lennus, Macross, Ogre Battle, Yoshi's Island, Starfox / Starwing, Tactics Ogre, Tenshi no Uta, Terranigma, Tetris Battle Gaiden, Tokimeki Memorial, Vortex..... and lots, lots more) all categorised into 4 'quality' classes. I have gone one further than just simply rate the music: I have specifically classed every soundtrack from the game. For example, if you want to hear only the best tracks from 'Final Fantasy', then just check the first and second classes. Also, you'll see a list of tunes chosen for miscellaneous reasons. They could be short'n'sweet, atmospheric, zany, terrible (! ), or have a neat effect... - basically, if it stands out in any way, it gets listed there. Obviously, I haven't gone through /every/ game, and so if there's an obscure SNES game that has some good/great music, then please let us know. Likewise, if you think that one of the tunes deserves a higher/lower ranking (or think I've missed out a gem), then please contact me or write to the forum. See if you agree with the choices! If for any reason, you'd like to see this table separately, visit here. It seems as though browsers such as Netscape 4.x and Opera currently have trouble with scrollable inline windows, so also visit that page if you're using those browsers. Hundreds of hours of listening, re-listening, compiling, careful filtering and judgement has gone into it. Even if a game features only one good tune, it will still find a place in one of the four classes. Such is the wide disparity in quality (as with all music! ), it was possible to subdivide the collection further still. However, although this might achieve greater accuracy, for practical purposes, I decided four classes would be sufficient. In the future, I intend to add comments to the first and second class music, and lots more new tunes of course (which will be covered in the news) - so be sure to return! 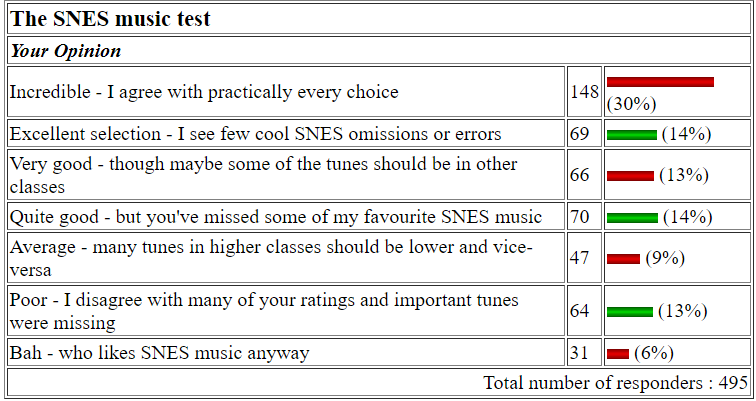 What proportion of SNES tunes assessed so far even qualify to make it into the table? I would guess only about 8 percent of everything I've heard - make it into one of the four classes. So in a way, even the relatively low 4th class is 'cream' up to a point. Judging by the results from the poll, a few people are wondering why titles like 'Ys', 'Fire Emblem 4' and 'Secret of Evermore' aren't listed higher up the table. There are good reasons though why they aren't listed higher. After re-listening to Secret of Evermore for example, I found some expertly crafted 'ambient' style tracks - and there's no doubt these enhance the atmosphere of the game when actually playing (stuff like lush river / rain sounds and realistic crowd soundscapes). However, they have limited table placement (or are left out completely) because they aren't particularly fun to listen to in their own right (i.e. when not playing the game). In 'Fire Emblem's case and 'Ys', well... I'm sure they also benefit more when actually playing, but all in all - they still have a long way to go before matching up to the best tracks from 'Bahumat Lagoon' or 'Secret of Mana'. It's also important to say that music which has been remixed for the SNES (such as Beethoven's Earthworm Jim 2's rendition of Moonlight Sonata) will receive a 'drop' in score. This isn't anything against the piece in question (which would probably reside in first class if it was an original tune! ), but since music like this has been heard so many times by everyone, it's more appropriate lower down the table. Parodius is an interesting case though. The music is 'remixed' from previously heard popular tunes, but enough has been done (e.g. adding crazy sounds, new instruments and an upbeat rhythm) to ensure a unique listening experience. There are a few tunes which unfortunately don't sound right when played through certain SPC players. If you're using Super Jukebox, there's an option in the preferences - "Use old ADPCM method". If any tunes seem to have 'buzzy' instruments which sound wrong, you might want to try turning this on / off. The default is off, but this won't work with all tunes. A classic case are the tunes from the Sailor Moon series or 'Kirby's Avalanche'. In some cases though, there's no solution, but I have managed to hear them properly (on one of the Amiga's players in fact), so the rankings for 'glitchy' tunes like this will be for how they originally sound. Thankfully, these 'timing' and 'missing channel' problems are not too common amongst SNES-emulated music. At this point reside the vast majority of SNES tunes. The quality assessment given to this category is 'listenable to good'. This means that if I am not in error and my ratings have been fair - anything that's not listed at least 4th - is either too dull to be worth listening to, or I haven't heard it yet. Just like the other classes, this category has a 'fairly wide' span of quality. There are many entries that just scraped in, and quite a few that just missed out on 3rd class. This is to be expected - I have to draw the line somewhere. Throughout the history of this table, I have often relegated and promoted certain tunes. I would like to stress this isn't because my taste in music is 'changing', but it is in fact because after repeated listenings, I'm getting a better judgement of the tunes. Secondly, I'm finally getting to grips with exactly what defines a 1st, 2nd, 3rd or 4th class tune. I'm happy to say though that thanks to repeated hearings, all the tunes are beginning to 'stabilize' and there will be very few changes in future (apart from completely new additions of course). I am always open to debate and will be as objective as possible in saying why a particular tune is ranked so high or low (...or not at all - gulp ;-). It probably goes without saying that if you can't find your fave SNES game's tune under the letter you have looked for, then think of an alternative name (e.g. insert the word 'Super', or think of the European / US / Japanese name).... or simply search for one of the keywords in the game's title using the browser's search feature. Pushover The music barely scraped into 4th class, but had this been the superior Amiga version of Pushover - you'd see at least one in 3rd class. No doubt the real 'space' level tune is about a million times better than the SNES equivalent. Super Turrican 1 The "26 (Credits) Ending" is in 1st class (mostly thanks to the brilliant middle section), but the same tune from the CD version from Chris Huelsbeck is actually slightly better (in sound quality at least) ! Axelay Only kidding - this music has only been released on the SNES. Actually, that's not strictly true - there's an Axelay OST CD. It has the same identically arranged SNES tunes and a few remixed tunes (which incidentally aren't quite as good as the originals, but certainly worth a listen). Kirby Well, it has to be said that the SNES is certainly the greatest resource for Kirby tunes. Remixes of classic Kirby tunes have been ported to the N64 and Gameboy etc., but as far as I know, none of the tunes match the SNES's. Gradius 3 Comparisons of the tunes from the arcade version will be made with these in the future. Street Fighter 2 These SNES versions of Streetfighter 2's music are generally better the arcade originals'. However the exception is Ken's stage music orchestration - which is better in the arcade version. Also note that the music from SNES Super Streetfighter 2 has worse remixes than original SNES SF2. U.N. Squadron Music ported from the arcade version of UN Squadron. I'll add a comparison later. Megaman A lot of you seem to like the Megaman music, but if you can, try and hear the Saturn version of Megaman ('X' I think it is, though I'm not 100% sure) - it's much better. Puzzle Bobble Woah. It's an understatement to say that the arcade music from Puzzle Bobble 2 (also known as Bust-a-move 2) is better. Make sure you listen to it ASAP. Super James Pond 2 Interestingly, there are 2 versions of the (same?) game. And two slightly different orchestrations. It turns out the 'Super James Pond 2' music is a bit better than 'Super James Pond', but neither can match up to the Amiga version of Robocod - which has even better instruments & orchestration for the same tunes. Super Ghouls and Ghosts Hmm... Different music to the arcade, Amiga / ST and C64 versions. Interestingly, the C64 music of Ghouls and Ghosts by Tim Follin is by far the best. (See the C64 page for the top Commodore 64 music. Super Pang Same tunes, but definitely worse than the arcade version's music. Interestingly, the Amiga version of Pang's music is slightly superior to even the arcade's catchy ditties. Cheers go to Ocean France who ported a perfect conversion to the Amiga at the time. Nobunaga no Yabou Haouden - One particular tune from this game - "05 (Usual Theme)". I'm not sure whether Yoko Kanno re-orchestrated this tune for the SNES, or whether it's the 'original', but what I can say is the CD version (Uncharted Waters II Special Edition) is about a million times better! Visit here for samples of the music (or to even purchase the CD). Thomas the Tank Engine Tim Follin did a remarkable job of converting the famous TTTE TV theme tune to the SNES - "01 (Title Theme)". Top Gear These SNES renditions pale in comparison when put up against the Amiga 'Lotus Espirit Turbo Challenge 1' tunes. The bass is weaker, and the meaty electric guitar sounds from the Amiga version are replaced with 'washed out' synths. Based on the data in the table, I have also compiled the top SNES games music sorted by quality. The way it works is this: 4th class tunes add 1 point to a game, 3rd class tunes add 3 points. 2nd class tunes add an impressive 8 points to a game, and should any game be lucky enough to contain any 1st class tunes, then 20 points will be rewarded. A game must collect a minimum of 8 points to be listed. 1: Secret of Mana (Seiken Densetsu 2) 195 !!!! 3: Pop 'n' Twinbee 152 !!! 4: Kirby Super Star DX 117 !! 5: The Legend of Zelda 3 - A Link to the Past 111 !! 6: Street Fighter 2 97 ! 7: U.N. Squadron 94 ! 8: Super Aleste (Space Megaforce) 81 ! For some great 'old-school' style game music, visit Skytopia's Soundburst Shrine here to download music in mp3 format! Have you any comments about this page or think I've missed out your fave SNES tune/s? Visit Skytopia's Leisure Zone Forum. See final results of Guile poll! See final results of Hyrule Castle poll! See final results of Ripple Field poll! Have you any comments about this page or think I've missed out your favourite SNES tune/s? SNES table - - - Frame-less page of the main SNES music table. Top SNES music reviews - - - Separate reviews of the best SNES music. Greatest C64 music - - - The top Commodore 64 tunes reviewed and rated. Soundburst Shrine - - - Download a full track and free clips from my Eclipse of Mars CD album. Arcade video games + MAME - - - Overview of MAME and other Arcade game trivia. Records and High Scores - - - Some of our greatest videogame achievements. VORC - A great resource of video game music news. Updated often too. Magnificent Super NES Soundtracks - Featured on Rey Esteban's blog, this is a fine collection of SNES music reviewed by various people (that page contains the intro, though the VGMuseum version has slightly higher res graphics). Also check out ReyVGM's Overlooked Super NES Soundtracks for more SNES music goodness. Autofish - SNES music box - Autofish's collection of favourite SNES music with music available for download. Zophar's Domain: SPC Archive - Very extensive SPC library. SNESmusic.org - A comprehensive source of downloadable SNES music and information. Nintendo Land - One of the nicest sites I've seen. Packed with trivia, reviews and everything Nintendo. SNES music and graphics on this page are copyright the companies/creators that own them. Reviews are copyright D. White 2002 onwards. There are no snes roms on this or any affiliated sites.